The 10-Day detox basic supplement pack – Purelean Pure Pack kit is a one step solution to have proper detoxification of the body and also to provide certain necessary mineral supplements. This 10-Day detox basic supplement pack is a unique combination of the ingredients in this supplement pack provides cellular sensitivity to insulin and to sustain the metabolism of excess fats or sugars. Dr. Hyman’s 10 day detox program is a healthy way to get rid of the toxins that are added into our system. These toxins definitely interfere with the normal metabolism and can upset any weight loss program, making fat loss nearly impossible to get rid of. This makes a detox program highly essential in order to have weight loss. Dr. Mark Hyman, a nutritionist, has come up with a 10 day detox that is not only effective in getting rid of the toxins but also balancing the sugar level in the blood and remove the deadly sugar addiction. This 10-Day detox basic supplement pack makes the first step for a weight loss program and also beneficial for diabetic as well as pre-diabetic patients. What is the 10-Day detox basic supplement pack? This 10-Day detox basic supplement pack is a program developed by the Dr. Mark Hyman to enable people to have proper and nutritional detoxification. The multivitamins, taurine, omega fatty acids and the nutrients in this pack helps improve the metabolism, remove the toxins and also reduce the appetite to control the sugar cravings. The 10-Day detox basic supplement pack – Purelean Pure Pack kit is a one step solution to have proper detoxification of the body and also to provide certain necessary mineral supplements. For major weight loss, this 10-day detox basic supplementary pack makes way for the major changes by setting the base by clearing the lymphatic system and increased metabolism. The nutritional ingredients in this 10-Day detox basic supplement pack mentioned here are from the various tablets and capsules included in this kit. Multivitamins and minerals are basic essentials for a balanced blood sugar level. It also contains vitamin B complex, vitamin C and E.
The macular synergy complex is for the eye health. The blend of lutein and zeaxanthin for the major macular functions. The metabolic GlycoPlex is the blood sugar balancing ingredient made with alpha lipoid acid, cinnamon, and L-carnosine that serves as phytonutrients and antioxidants to improve the insulin sensitivity of the cells and to avoid free radicals. Metabilc LipidPlex is a blend of catechin from Green tea, taurine etc also to support the insulin sensitivity, fat burning ability, and metabolic activities. The alpha lipoid acid and glucophenol is to support the nerve function as it can go down in diabetic and pre-diabetic patients. It serves as an antioxidant and can also boost the mitochondrial functions to have better metabolism. The Glucophenol is the blend of cranberry and Orleans strawberry extracts to provide the phytonutrients helping in blood sugar balance. Omega-3-fats are for nervous and cardiovascular systems health and also to improve the immune system. It can also improve the insulin sensitivity and helps with blood sugar balance as well. Magnesium is significant to influence 300 odd enzymes that take part in the metabolism, blood sugar and insulin activities. Taurine is an antioxidant for the overall health improvement. The SlimStyleS PGX is taken one pack each, 15 minutes before breakfast, lunch and dinner. From the Pure Lean pack, one can take the contents of the single pack – 7 capsules in all, at the same time or divide it as recommended. There are 3 multivitamin pills of which 2 are to be taken with the breakfast and one with dinner. The rest of the pills from the PureLean pure pack are taken with dinner. The Vitamin D3 is taken one pill each with breakfast and dinner. The recommended dosage allows maximum absorption by the body than taking all the 7 pills from the Pure lean pack, at once. Alyssa states that she found this 10-day detox plan was pretty good. She was had no physical or medical problems yet tried this detox, only to find her 10 lbs lighter by the end of 2 months of usage. The drawback according to her is her inability to have enough energy to last her usual workout regime and her sugar cravings still remained but had reduced much. Camille feels that her body feel great after using Purelean Pure Pack plan and has also been able to lose 5 pounds. The first 3 days were terrible with nausea which was better as days passed. She also states that this detox plan has urged and made her favourable for a high fibre diet and helped her rid of a larger portion of sugar and sweets as well. Ellen had a different opinion that the 10-day detox plan which the inventor states as a not so difficult to follow. She feels the detox plan that demands an 8 hour sleep, half an hour workouts in morning and the different types of food preparation is difficult for those who have little children. She feels, there are a few positive points with these detox yet, she was not a big fan of it. Is there any side effects for the 10 – day detox? There are no known side effects for this 10-day detox basic supplement pack, as it is. All the ingredients used in the making of the nutrients added in it is in compliance with the health department and are completely safe to use. But there might be some discomforts due to the toxic elimination from the body. Symptoms like, headache, bad breath, constipation, nausea, sleep disorders etc are quite common. These symptoms will pass within the initial days of the detox and vary according to the level of toxicity in the body. People who has less toxins will have lesser symptoms and those who have toxicity levels may experience intense symptoms in a wider range. The possible side effect of the 10-day detox basic supplement pack is a sudden drop in blood sugar level in diabetic persons. As there is the use of PGX and other blood sugar balancing ingredients in the detox program, it may collide with the diabetics medication to cause a drop in the blood sugar. Therefore, one needs to get in touch with their physicians to adjust the dose of the diabetics medicine to avoid this consequences. What does the Purelean Pure Pack kit contain? This 10-Day detox basic supplement pack – PureLean pure pack contains a blood sugar balancer – SlimStyles PGX singles, vitamin D3 1000 IU capsules and a pack of the Pure lean pure that has the multivitamins, magnesium glycerinate, taurine, alpha lion acid, and EPA/DHA in it. The SlimStyles PGX singles is on powdered form which is easily soluble in any food and does not have any flavour. The vitamin D3 is in capsule form. The PureLean our pack has 30 individual packs for daily dose. One single pack is for one day and each capsule or pill in this pack can have all at once or split the capsules conveniently as recommended. How does this Purelean Pure Pack? 10-Day detox basic supplement is meant for the initial detoxification prior to weight loss programs or as a way of resetting the body metabolism for those who are on the verge of being diabetic or has already diagnosed with it. This 10 day detox program improves the insulin sensitivity of the cells and make better use of the available insulin to control the blood sugar. It is also working to reduce the appetite and eliminate the sugar cravings and people end up eating less, which helps with the weight loss programs. By adding many antioxidants, vitamins, minerals and other useful nutrients, this 10 day detox by Dr. Hyman improves the overall health of the person and make them more immune to the diseases as well as the deadly sugar in the diet. The food regardless of what type, contributes to accumulation of many toxins, unless it is organic. These toxins gradually increase in amount and later affects the various internal systems of the body. Many of the common diseases are an after effect of toxin accumulation that disrupts the normal metabolic processes. Detoxification is the short cut to a healthier body and to eliminate many diseases, including cancer. Who should take the 10-day detox basic supplement pack? Anybody above the age of 10 years can take this Purelean Pure Pack plan. People who are often sick and find some kind of health issues constantly will benefit much from this. All these discomforts show the toxicity inside the system and this detox will eliminate all that are offending. If you are obese, you should definitely try this 10-day detox and you will be amazed with the results. The metabolism will increase and that help with improved health for all vital systems. Even if your health problems are genetic, trying this 10-day detox will sure help in controlling the health issues, that are especially related to blood sugar, fat deposition and toxicity. Young children, elderly people, people with some chronic diseases, pregnant women and ladies who are nursing their babies should not use this 10-day detox. The ingredients in the detox program might slow down the absorption rate of the medications and make them less effective. Anyone who is using any kind of prescription medicine must consult their doctor before starting this detox. What are the benefits of using 10-day detox basic supplement pack? Detoxification of the entire body is the primary benefit of using this 10 day detox program. The other benefits are, being able to balance the blood sugar level in all, reduced blood pressure and improved cardiovascular health, less cholesterol, triglycerides and fat deposition, improved digestive system functioning and better nutrient absorption, increased energy because of the increased metabolic rates and strong immunity. Apart from these, better skin health and slow ageing are the benefits of this 10-day detox basic supplements pack. Why use PGX daily singles for a detox program? The main reason why this is added in this detox program is its ability in controlling the sugars. It reduces the glycemic index of the food items in the meals and help with normalising the blood sugar levels. PGX singles is a blend of polysaccharides and finer to help with the removal of waste from the digestive system. It absorbs more water making you feel fuller even before you fill up your tummy. By adding PGX singles in this 10-day detox program, Dr. Hyman is helping you to control the blood pollution by the normal food that we all eat. Food is the main source of many toxins and PGX plays major role in eliminating as well as preventing them in the system, making the 10-day detox easier. It is also helpful in reducing the cholesterol and triglyceride levels which are elevated. It can be used as part of the 10-day detox program or can have it separately for general wellbeing. What is the significance of Vitamin D3 in the 10-Day detox basic supplement pack? Vitamin D3 is known for its support of the colon and the cells in this region. By improving the colon health, it is helping with the waste removal effectively. This is the main reason why it is added in the Purelean Pure Pack. The same vitamin also has significance in improving the calcium and phosphorous absorption and thereby improving the cardiovascular health. It is good for bone health and can elevate the immunity. The vitamin D receptors in the immune cells are activated. In this 10-Day detox pack, it is the Vitamin D3 1000 IU pack which is added. What can I do to avoid the detox symptoms? The symptoms occur due to the withdrawal of many addictive food items and the presence of more toxins in the blood and digestive system. To avoid these symptoms, drink plenty of water and take adequate rest. While avoiding the food items, make it slow and gradual so that the body gets used to the elimination. Take Epsom salt baths or soak the feet in the Epsom salt solution for a while. Consuming activated charcoal may also be done. Take fresh air by walking in the mornings and get exposed to mild sunshine to get natural vitamin D. do some dry brushing over the skin to improve the blood circulation and to remove dead skin cells. The improved circulation will carry the toxins to its disposal area soon. Take food regularly at the same time and do not make the body starve. Scrape the tongue regularly to avoid bad breath, do some intense workouts to avoid the lethargy or fatigue experienced as a result of the detox. How long should I use 10-Day detox basic supplement pack? The 10-day detox basic supplementary pack is made for the 10 day detoxification but the length of administration is flexible according to the toxicity level of the person. It must be consulted with the doctor to known exactly how long you should use this 10-day detox. It may be just 8 days or as long as 6 weeks. Further more, there will be a quiz the customer needs to take online while on this 10-day detox and the extension of the detox will be decided according to the quiz results. You will be required to keep a journal of the food you ate and it will help with the quizzes and also later. The Dr. Hyman’s 10-day detox basic supplements pack is completely safe to use for longer period to maintain healthier body. Thee at product included in this 10-day detox pack is also available as separate products. 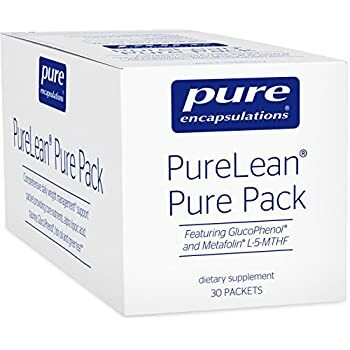 Is there any meal plan that I should follow when using the Purelean Pure Pack? Yes, there is. It is nothing difficult, just the basic regulations. It is to avoid any offending food that contributes to an increase in blood sugar level immediately. Say no to sugars, too much of bad fat, simple carbohydrates like flour, pasta, anything that is categorized as sugar, starch, fatty dressings and dips etc. Instead you may include lots of fruits and vegetables in the diet. Berries can make the best dessert after the meals. For details please refer to the 10-day detox Diet book authored by Dr. Mark Hyman, the renowned nutritionist. A quick meal plan for the first week is also available online, which explains the breakfast, lunch, snacks and dinner for each day of the week. The recipe to the dishes mentioned are also available, making it even more easy for you. How effective is the Purelean Pure Pack for weight loss? The 10-day detox basic supplement pack by Dr. Hyman, basically is a pre-weight loss program. Yet it is effective in reducing some amount of body weight as many toxins are eliminated from the body and the body metabolism is reset to normal rate or slightly higher than it actually was. The metabolic rate increase itself will burn some amount off at cells resulting in a reduction of few pounds. For major weight loss, this 10-day detox basic supplementary pack makes way for the major changes by setting the base by clearing the lymphatic system and increased metabolism. Dr. Hyman’s 10-day detox is also reduces the sugar cravings that will help in controlling the appetite and less food intake. Many obese people do overeat and with this detox program, they can control the appetite and avoid overeating. Any addiction to the problem food is easily stopped with this 10-day detox. Is the 10-day detox basic supplement pack is only for weight loss programs? No, the 10-day detox basic supplement pack is a basic detoxification aid that is meant to remove the toxins from the body. The weight loss and other diabetic uses comes only next. People who have healthy BMI and good cholesterol or blood sugar levels may also use this 10-day detox. If they do suffer from any kind of allergy, immune problems, then this 10-day detox is just right for them. They can stick to the basic 10 day detoxification to get their overall health back in track. How to purchase Purelean Pure Pack? Purchasing the 10-Day detox basic supplement pack is easy and is available at the online store, directly from the Dr. Mark Hyman’s official site. The product is eligible to avail the auto-ship program that will have the next batch delivered even before you finish the current pack, for those who use a long term detox program. The auto ship program allows the product delivered in every 1-30 weeks or once a year. The shipment options available are standard ground that will have the product delivered within 5 working days, 2 days delivery through air and an overnight delivery as well. The ordered product will be shipped the very same if the order is placed before noon of the day or the very next day if the order is done later. Is the 10-Day detox basic supplement pack – Purelean Pure Pack available in Canada? Yes, the 10-Day detox basic supplement pack-PureLean Pure pack is available in Canada also. The product can be ordered online and it will be shipped to Canada. The customer may have to pay for the additional taxes and duties applicable in Canada. It is the customer’s duty to ensure that the product ordered is allowed in Canada. In this case, because of the inclusion of Vitamin D 1000 IU, the product may need the approval of the doctor in Canada for it to be imported. The 10-day detox basic supplement pack is not available on Amazon but the supportive diet book that explains the allowed foods and foods that should be avoided are all explained; and the 10-day detox cookbook with lots of recipes that can be consumed while on this detox. What are the pros and cons of 10-Day detox basic supplement pack? The pros of 10-Day detox basic supplement pack is that it is easier than the programs and here you are actually able to eat. There is no need to starve and the PGX will keep the appetite at bay without bothering. This 10 day detox is easy to follow without slipping in between and runs only the smallest duration for many. The drawback that is against this product, or the most difficult part with this 10-day detox is that the users will have to stay away from any kind of electronic gadgets for as long as possible. The con that weigh against this product is its price. Many customers felt that the price at which this is sold is a bit on the higher range. Many feels that just to avoid sugars and gluten from the diet shouldn’t have cost this much.